Usually, accents are used in interior design to add color, texture, and pattern and help create fascinating, visually interesting spaces. Whether accent walls, furniture pieces, or furnishings, accents are a way to enliven any space and express your personality. Actually, it is not that difficult to add an accent, just think outside the box, sometimes even a small piece of bold wall art can lend a completely different look to any space. Unexpected, dramatic pops of color in a neutral space, furniture of bold design, and eye-grabbing lighting fixtures are some of the most favorite options to create accents. When it comes to creating accents, always consider throw pillows and blooming flowers, they are an easy, affordable solution. As they add texture, color, and pattern, fabrics are also a common way to introduce accents, in one way or another. Generally, work with what you already have, sometimes even rearranging your living space can work miracles and help create stunning focal points. Accent walls create visual interest, add a sense of dimension, highlight architectural features, define zones in multifunctional rooms, and transform ordinary spaces into bold, unique ones. From paint, wallpaper, and fabric to exposed wood, stone, and brick to art displays and wall murals, there is an array of ways to create accent walls. Using dark colors to create contrast and add some drama in spaces painted in light colors, incorporating colored stripes and graphic shapes, and introducing pops of color in black-and-white and monochromatic spaces are some of the common, favorite paint options to create accent walls. Note that removable wallpaper and decals, as well as fabric coverings, are some easy, affordable, no-paint renter-friendly solutions, which work well with any style. They add color, pattern, and texture and can vary from simple floral patterns to intricate designs. Unleash your creativity, go bold, and try some truly unusual solutions, such as corrugated metal, cork, or tufted walls that can definitely help create spaces with an unmatchable look and tons of personality. 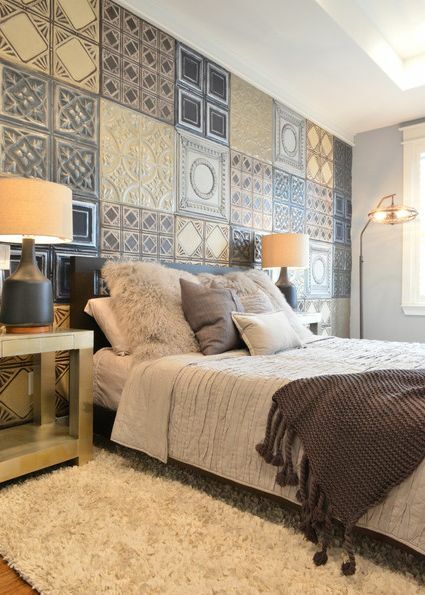 In the above-shown master bedroom, tin tiles of different patterns create a gorgeous accent wall. What a way to add pattern and texture and personalize this space! Truly impressive! Ceilings are a solution to add decorative accents and enhance the look of rooms with many windows. However, paint and wallpaper are common, easy options. In the picture above, a bedroom with a soothing atmosphere. 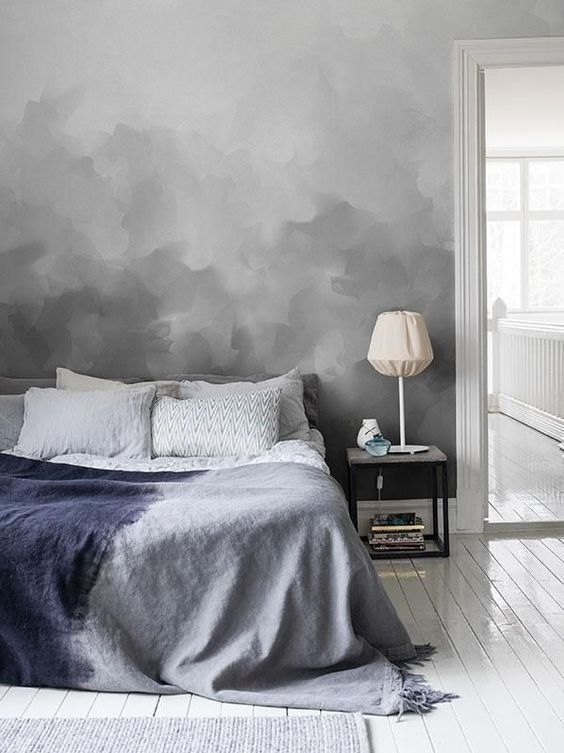 A cloud-inspired gray ombre wall complemented by bedding and an area rug in the same hue helps create a truly stunning bedroom of minimal design. As stripes define rooms, create a sense of space, order, and balance, and add touches of elegance and sophistication, they are a spectacular solution for accent walls. Above, grasscloth wallpaper with metallic accents wrapped on horizontal boards helps create a unique, eye-grabbing wall. A stunning metallic pendant adds some extra personality and sparkle. Since wood always creates a sense of warmth, coziness, and softness and adds texture, it is a perfect option for accent walls in contemporary homes, which are dominated by concrete, glass, and stone. Above shown, a bathroom with a dark wood accent wall. 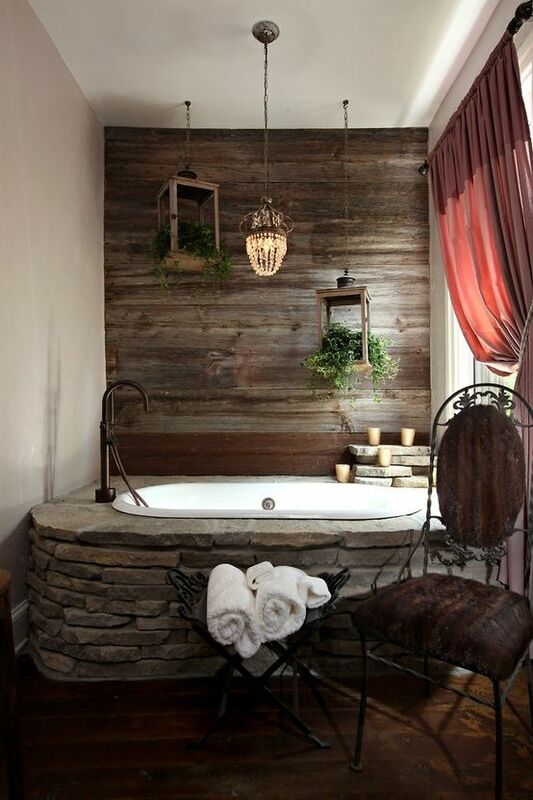 Stone bathtub surround and a wrought iron chair and towel storage option add to the rustic vibe of the space. Hanging planters and candles bring extra visual interest and undeniable charm. A pendant adds sparkle. Rustic yet so elegant, sophisticated, and inviting! From furniture pieces to light fixtures to area rugs and window treatment to wall hangings, there is a variety of ways to incorporate accent furnishings into any living space. Accent pieces immediately grab the eye and go far beyond pure functionality because they have decorative value. Furthermore, statement items add visual appeal and interest and touches of drama. When it comes to furniture, it can range from ultra-modern to vintage, it all depends on the taste and preference of the homeowner. Whether an ornate chest, a bed with a wrought iron frame, an imposing dining table, a kitchen island with gorgeous countertops, or a couch with velvet upholstery, any piece of furniture that stands out because of its design, color, material, or style can become an accent item, a focal point, which enhances the look of the space. In bedrooms, canopy beds, which help create a romantic atmosphere and add touches of elegance and luxury, are a favorite choice for incorporating an accent piece of furniture. In the picture above, a bedroom with a distinctive feminine look, which exudes elegance and softness. 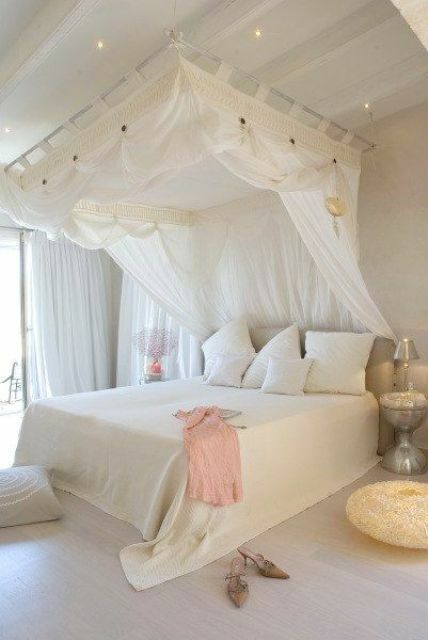 A canopy attached to the ceiling with beautifully draped curtains immediately grabs the eye. Different textures help lend a sumptuous, layered look. Sparkling décor elements and subtle pops of color add visual interest. What’s not to like in this space? Light fixtures, from sculptural table and floor lamps to dazzling pendants to crystal chandeliers, are another way for creating accents, which can add visual interest, add touches of drama, sparkle, and sophistication, and personalize the room. Furthermore, when carefully chosen, a light fixture can take any space to the next stage. Always consider crystal chandeliers, they are the perfect option for adding sparkle and instant drama and charm to any space. They immediately become focal points, statement pieces on their own. 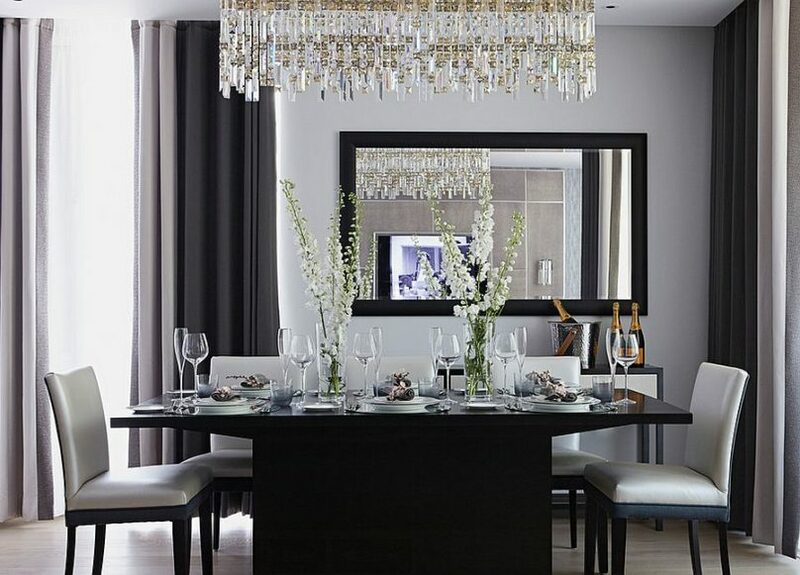 Above, a sophisticated formal dining room in gray and black. A magnificent crystal light sculpture dropped over the dining table grabs and keeps the eye. It is far more than a simple source of artificial light, it is rather a crosspoint of functionality, aesthetics, glamor, and elegance, an exquisite piece of art, which captivates with its beauty. An oversized mirror reflects light and creates a sense of space. Definitely, a magnificent way to add an accent! Area rugs, window treatment, pieces of art, mirrors, and wall hangings are also common, easy ways to incorporate accent furnishing pieces. They add color, pattern, texture, and visual interest and usually help lend a layered, complete look. When used in an unexpected way, all these furnishings can definitely personalize any space. In the picture above, a master bedroom with a harmonious, balanced, layered look. 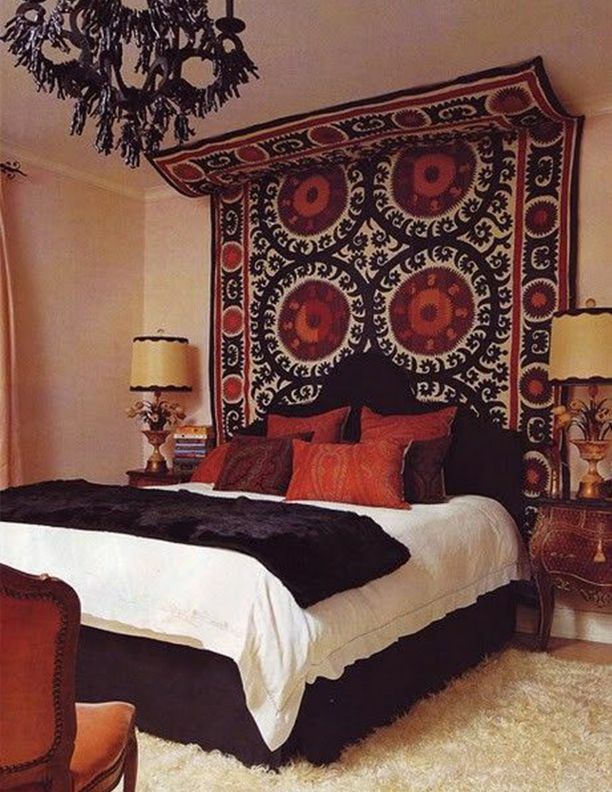 A large ethnic rug used as a canopy adds character and undeniable charm. Definitely an inviting space! Decorative items offer the simplest way to create statement décor elements. Depending on the function of the space and the lifestyle and taste of the homeowners, they can range from figurines and candles to wooden bowls of fruit or vegetables to potted plants and flower arrangements to pottery to antique books and ornate trays, the options are endless. 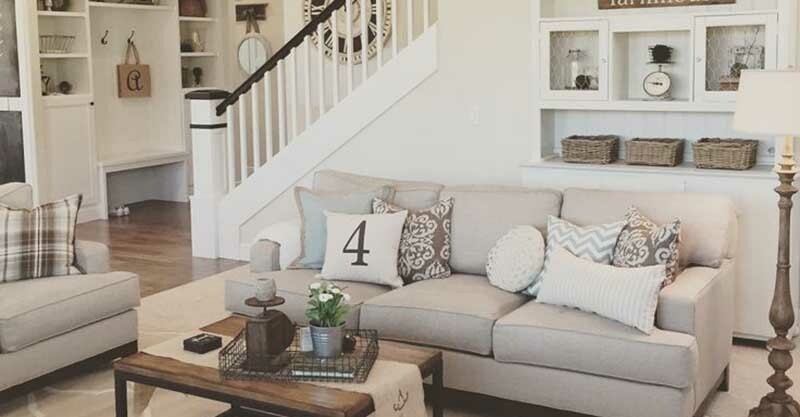 When it comes to bedrooms, living rooms, and window nooks, always consider throw pillows and throws, they create a sense of coziness and warmth, add color, pattern, and texture, and are an easy, budget-friendly solution to include make-a-statement décor. Collectibles, wall galleries, and memento displays are also a favorite choice to enliven spaces and create accents. 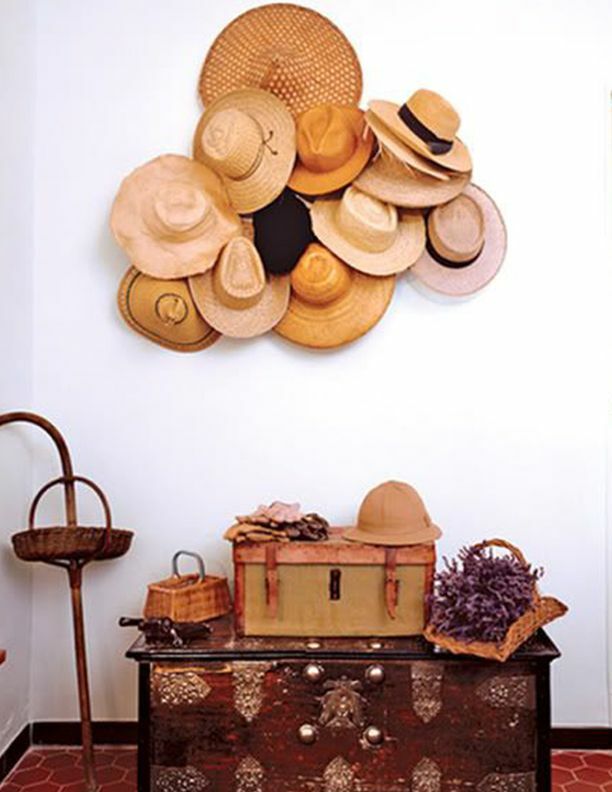 Above, a hat collection complemented by charming vintage items definitely stands out against the background of the white walls. What a fascinating display! In the picture above, a fascinating purple bedroom. Black décor pieces add extra touches of drama and elegance. Multiple candles of different size and color make a statement arrangement and help create a magical atmosphere. This bedroom with a layered look is definitely pure charm and romance. Whether walls, furnishings, or accessories, large- or small-scale accents create interiors, which offer visual appeal and interest and have tons of personality.